Tracks on Pepi’s Face in Vail last week, where abundant early-season snowfall has the mountain opening early on Wednesday, Nov. 14 (David O. Williams photo). 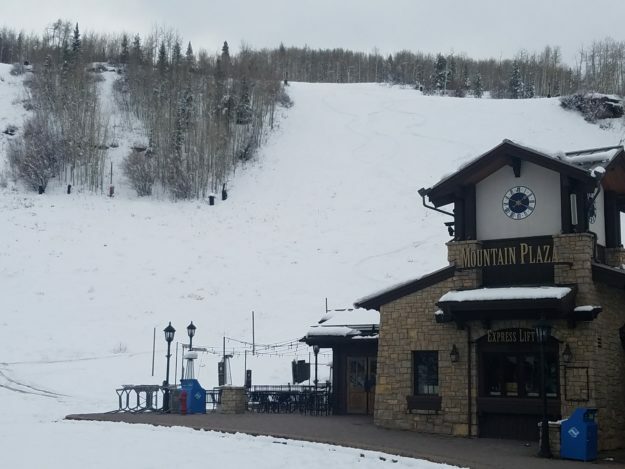 Vail Mountain and Beaver Creek will open early for the 2018-19 ski season after yet another fall snowstorm rolled through the Vail Valley over the weekend. Both ski areas will open with top-to-bottom skiing. Forecasters say the cold storm that blew through over the weekend, leaving more snow on the Front Range than in the mountains, is heading out, and we’re now heading into a warming and drying trend for the next week or so. Vail Sports locations in both Vail and Lionshead Villages will be open on Wednesday, from 8 a.m.-6 p.m. Guests can also book their rentals online in advance atrentskis.com. Paid parking in the Bear and Elk Lots will begin on Nov. 17. Parking is $10 per day and is complimentary after 1 p.m. A 10-day punch pass is available for purchase for $75 and is available at the Ticket Offices in Beaver Creek Village. Complimentary direct shuttle service is provided from each lot to Beaver Creek Village. The Beaver Creek Village Connect app is now available for download on the Apple App Store or Google Play. The new Village Connect app provides door-to-door, on-demand rides and information to property owners and guests in Beaver Creek, Bachelor Gulch, and Arrowhead. For additional information regarding parking, call (970) 949-4911.